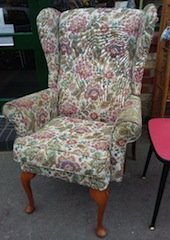 A vintage wingback gebtlemans armchair on solid wood legs, upholstered in colourful floral patterned fabric. 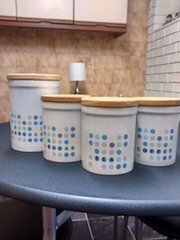 A collection of white polka dot ceramic kitchen canisters with wooden lids, includes a biscuit barrel and tea, coffee and sugar canisters. 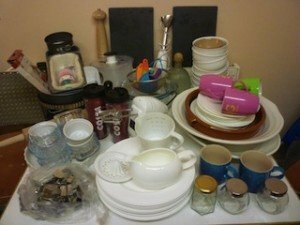 A large collection of kitchen accessories, to include a large wooden pepper mill, two costa coffee travel mugs, storage jars, dinner plates, a lemon squeezer, a jug, a hand blender etc. 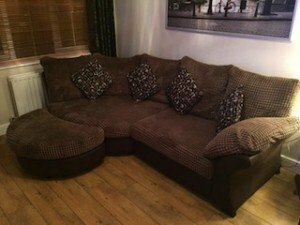 A four seater high back semi corner sofa and matching storage footstool, upholstered in chocolate brown faux leather and textured suede. 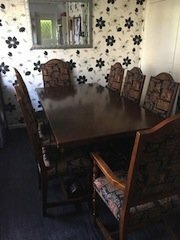 A vintage solid wood extendable dining table, together with eight matching dining chairs, upholstered to the seat and backrest in patterned navy blue fabric. 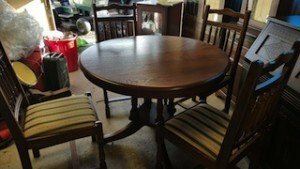 A solid wood circular extendable dining table, together with four matching high back dining chairs, upholstered to the seats in striped patterned satin. 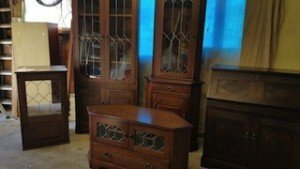 A five piece vintage solid wood furniture suite, to include a double door dresser, a corner display cabinet, a bedside cabinet, a television unit and a writing bureau. 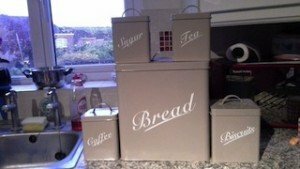 A collection of square cream metal kitchen canisters, to include a large bread bin, a biscuit tin and tea, coffee and sugar canisters. 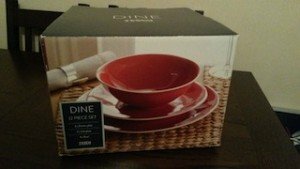 A brand new boxed Dine Tesco twelve piece organic autumn heat dinner set, to include four dinner plates, four side plates and four bowls. 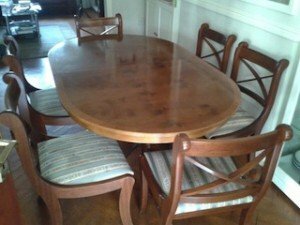 A vintage solid wood extendable oval dining table, together with six matching low back dining chairs, upholstered to the seats in blue and cream striped satin. 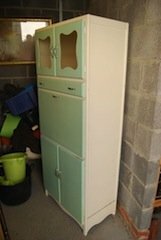 A tall standing pale green and cream retro kitchen dresser, having two glass inlaid doors above a single drawer, a pull out counter top above a double cupboard. 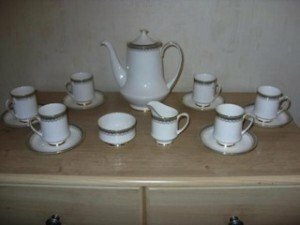 A vintage Paragon silver and gold decorated coffee service, to include a large coffee pot, six mugs, six saucers, a sugar bowl and a milk jug. 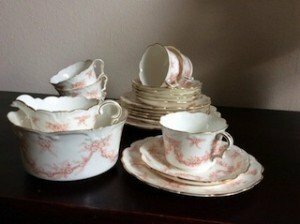 A vintage floral patterned and gold rimmed 21 piece tea set, includes teacups, saucers, side plates, a milk jug and a bowl. 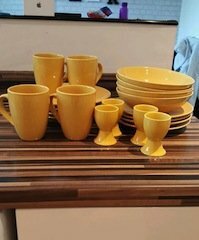 A twenty piece mustard yellow dinner service, to include four egg cups, four mugs, four dinner plates, four bowls and four side plates. 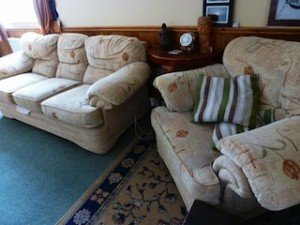 A three seater high back vintage sofa and matching armchair, upholstered in flower patterned cream fabric. 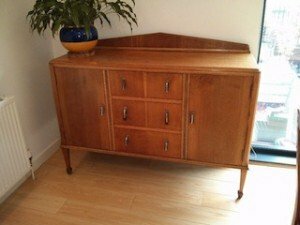 A vintage solid wood sideboard on arrowhead feet, having two cupboards aside three central drawers. 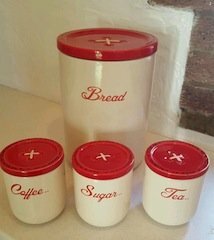 A set of ceramic red and white kitchen canisters, to include a large cylindrical bread bin and tea, coffee and sugar canisters. 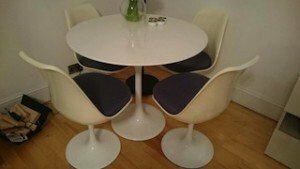 A contemporary white acrylic circular dining table, together with four matching swivel dining chairs. 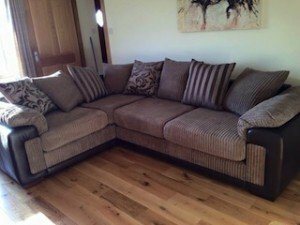 A four seater low back corner sofa on solid wood feet, upholstered in black faux leather and grey cord. 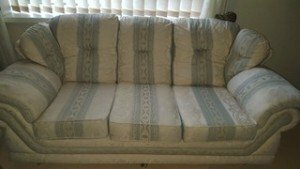 A three seater high back vintage sofa on chrome feet, upholstered in damask patterned striped satin.